The Beach Club condo for rent in Gulf Shores Alabama.A family friendly destination for your vacation. This lovely beach residence is located on the Club Level; well decorated with excdptional views of the white-sand beach and the Gulf of Mexico polus direct access to the private balcony from the master suite. A fully furnished kitchen includes range/oven, microwave, refrigerator/freezer, dishwasher, disposal and all the usual equipment to prepare any culinary treat; there is a laundry room is adjacent the kitchen. This condominium home is located close to the elevators on the 15th floor, providing fantastic views! The Beach Club is a destination resort with an array of resort-style amenities including restaurants & shopping - you'll never have to leave! Info: 3 BR, 3.5 BA Beachfront Luxury Property with approx. 2,300 sq. 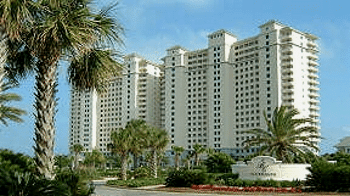 ft.
Orange Beach AL condo for sale at Turquoise Place. This beachfront luxury residence has a large private balcony with panoramic gulf views, a hot-tub and gas BBQ grill. Large kitchen with granite counter-tops, stainless steel appliances, a wine cooler and separate ice-maker. Community amenities include: indoor and outdoor pools, a lazy river, sauna, steam room, tennis courts, and modern workout facility and much more! Don't miss this exceptional condominium home offering the best in coastal living on the Alabama Gulf Coast.